Recopac (recycled ecological packing solution) boxes made from 100% post-consumer recycled plastics, available in three sizes. Geami, a 100% recycled cardboard sludge bubble wrap alternative to roll your valuables in. Recocubes, the 100% recycled newspaper sludge "peanut". And my favorite....Reco-zips (to seal the Recopacs), made from 100% recycled plastic bottle caps. 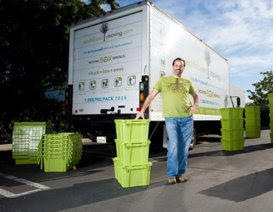 You can order your materials, and Rent-a-Green Box comes to your residence in a biodiesel-fueled truck to drop the goods off,(how cool, eh?!) and picks them up at your new digs when you're done unpacking. Now that's sustaino! The buzz word for some time now has been "carbon footprints". Companies are measuring in terms of energy usage, hours of commute, flying time, etc. 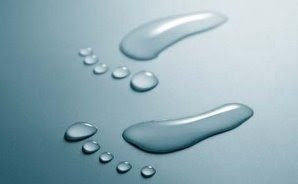 However, what about water footprints? Have you stopped to think about how much water you use everyday? Shower. Toilet. Brushing. Laundry. Dishes. - Those are just the basics. What about....washing your car? washing the dog? watering your garden? Historically water conservation has been an uphill battle due to the artificially low price of water. With a surging population, global warming and waste, many believe we are approaching “peak water“. We have a finite supply of usable fresh water. Of the earths water only 3% is fresh water and only 1% of that water is drinkable. Water is most certainly different than oil in the respect that we can not live without it. Sure, oil has alternatives, yet there is no alternative for water. So we must implement conservation efforts in every aspect of daily life and business. Many businesses recognize that water is a commodity and are implementing drastic conservation efforts to reduce need and in turn costs. As individuals we can reduce water usage by 50% by doing simple things like low-flow faucets, dual flush toilets, repairing leaky toilets and installing/replacing aerators on sinks. Have you heard about the Great Melt? I'm sure you have in some form of melting glaciers, shrinking ice worlds, etc. 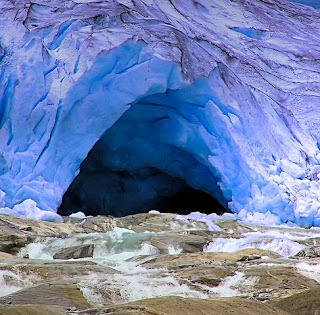 However, given technology efforts, scientists have actually been able to "weigh" our melting Alaskan glaciers. Thanks to NASA satellites, the GRACE mission allows two orbiting satellites to capture and calculate new, relevant data over various glacier hotspots in Alaska. The satellites are about 137 miles apart, pending the gravitational pull from the area they circling. By calculating weight change every 10 days, researchers determined that the Gulf of Alaska glaciers are losing 84 gigatons of mass each year, which is equivalent to the volume of the Chesapeake Bay. So why does all of this really matter? There will be scientists in the Arctic in 2009 interested in more than sea, ice and melting glaciers. Geologists are searching for the oil, gas and minerals that the melting ice might reveal. These experts will be busy mapping the sea bottom as the circumpolar powers—Russia, Canada, Denmark, Norway and America—try to prove that the Arctic sea floors are natural extensions of their own lands and thus belong to them. While the race is on to find oil and gas in the melting Arctic, it is the greenhouse gases that are generated from burning fossil fuels which cause the big melt. So the treasure-seekers should beware that the Arctic may take its revenge. One threat is of sea levels rising. Another comes from the lakes of floating fresh water amid the sea ice. If Arctic circulation patterns change, this fresh water could travel out into the Atlantic, and turn off the ocean currents that bring warm weather to Europe. Yet another is the release of methane, a potent greenhouse gas. Let’s hope that 2009’s scientific explorers give us the knowledge to understand the risks. Source: Popular Mechanics - 2009, The Economist - The World in 2008. In the past six months, I've read numerous articles about recent lead contamination - or at least high levels of lead in artificial turf at universities and sports facilities. Frankly, I am becoming immune to all the toxic news that I continue to hear. Why? Because it no longer surprises me. 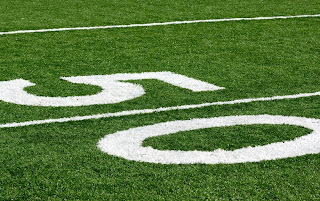 The trend of implementing artificial turf on school athletic fields has created political problems as well as a third party groups known as "nay sayers". Most often the funds for these fields are paid for by generous individuals or other sponsors with big brand names. So what is the remedy? You'll notice different positioning. As for fake grass, you don't need to mow it, water it, fertilize it, or trim it. A unique proposition to reduce one's carbon footprint. However, I stress to you that it most likely contains PVC, which means it lasts forever - even in the landfill. The alternative is to proceed with natural grass, which facilities managers could opt for electric mowers, organic fertilizers, low VOC paints, and post consumer materials for the foundation and covers. Moreover, what would be interesting to see the future of golf courses? Could we have more artificial based golf courses? Tiger Woods wouldn't be happy about that concept! How are they surviving in this economic recession today and even in the past six months when gasoline as at a record high of $4.50 a gallon. I'm sure many have closed doors and considered electric mowers and other incentives. What are your thoughts? For those that might not know, I love to play soccer. I play three to four times a week on a co-ed league. And I most say...I feel a little left out. Why? Apparel that is sweatshop free. All sports balls (soccer, basketball, volleyball) are certified - meaning it is stitched by adult workers paid fair wages who are ensured healthy working conditions. And to top it off - all after-tax profits are donated to kid's charities. 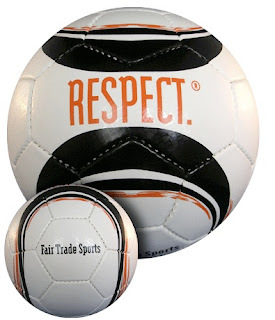 Their number #1 seller is the "Respect" soccer ball. Size 5 that costs $29.99 comparable to a Nike USA ball that costs $29.99. Consume less. Play more. I'm back my fellow readers from a long break. The holidays are over and it's a new year filled with resolutions and good times, right? How about going back to the basics of reduce, reuse and recycle? That's exactly what we need to do given the chaos we have managed to stir up again for our environment. Over 4.4 million tons of holiday gift wrap, shopping bags, and holiday catalogs are sent straight to the landfills each year. So looking forward, I'm going to dedicate the month of January to SPORTS and the outdoors. There are specific "green" toys that we can now enjoy that help the environment and help you get your game on. 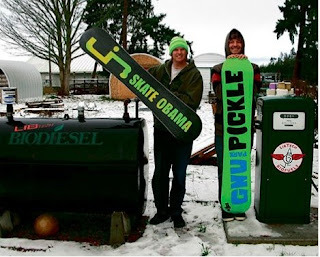 For starters, can a snowboard be green? I have a Burton Board. It rocks! However,..one you have to drive or fly the mountains. Two, you take a lift up that is supplied electric power. 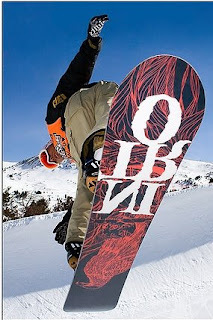 Three you board down artificially made snow. Then you repeat (questionable). Yet we as engineers and those that appreciate the outdoors have become open and receptive to new technology and standards. 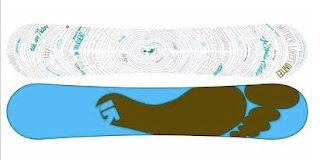 The new Burton, known as Eco Nico, has a Forest Stewardship Council-certified wood core, a lacquer-free top sheet, 90-percent recycled steel edges, 100-percent recycled sidewalls and a 50-percent recycled base. The Eco Nico is the greenest of the green, the most sustainable board that has ever made. And that my friends is a good start to a new year. Every little bit helps!